There are many reasons you may want to choose the best air compressor for paint sprayer. Whether you are a handyman or a homeowner, air compressors are a very important tool that you can add to your arsenal of tools. If you own any kind of paint sprayer that can work with an air compressor, you know that it can bring a lot of efficiency to your painting projects. There are many things to look at when choosing your air compressor. Just because an air compressor has a larger tank doesn’t mean it is going to do more than a smaller alternative. All you need is to understand the features, functions, and capability of each kind of compressor. If you are going to be moving from site to site while working, you need to consider portable compressors. Fortunately, most of the newer models now imbue this feature so that it’s not difficult to carry around while working on your project. Another thing is to consider the quietness of the compressor before going for it. Some of the complains that prop up from users is based on the noise level of the machine. Also, ensure the compressor is well built and very durable. Most users often complain that their compressors got leaking only after a few usages. If this is not a factory default problem, then it probably means that the compressor is not strong enough. This list includes models that are built to last longer and have a reputable brand behind them (as well as ample warranty) so you can buy with peace of mind. Proper maintenance is very important if you want to enjoy your device for a long time. It is recommended you drain the content of the tank after every usage, especially if you intend to not use it for a long time. Not doing this will make the tank rust quickly and that might necessitate replacement which is not a nice thing to have after spending so much on a machine. In the following paragraphs, I have listed air compressors for you paint sprayer with their features, advantages, as well as the disadvantages. You should be able to get one that suits your needs as well as your budget. 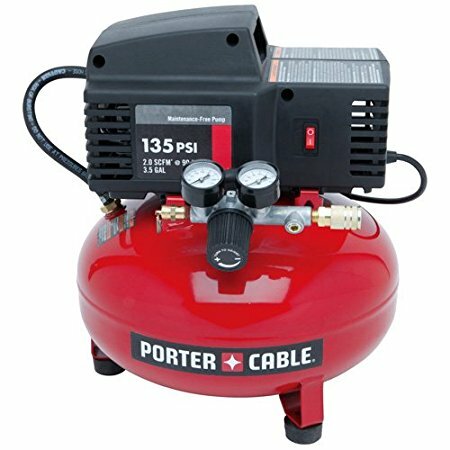 The PORTER CABLE PSI Pancake Compressor is one of the most versatile compressors you can find on the market that is used around the home, in work sites or as an emergency compressor on the road. It is basically used in situations where a moderately powerful compression is needed, that does not require industrial workload. Weighing in at 26 pounds, the Porter Cable is quite portable and can be carried around without much issue. You can easily enjoy up to a maximum running pressure of 90-PSI and there are two connectors attached to it that can be used for multiple tools as you like. Its air compression feature allows it to be used for tires and other medium sized inflatables. It also sports the perfect size and weight for carrying around compare to models of comparable price. It would be useful in the home, at auto shops or during marine-related activities. No doubt, this compressor works perfectly well with pneumatic tools such as handguns and blowguns. The machine has a 50%-70% average duty cycle, which means that it optimal work duration within an hour is 30 minutes and should not exceed 45 minutes. It is easy to use as it features clearly marked and large gauges that indicate outlet pressure and stored tank pressure. This paint sprayer weighs at about 20 pounds allowing it to be easy to carry from site to site. It has a wide range of functionality, as it can be used for trim work, finishing as well as in hobbies and crafts. Its 1Hp power allows it to be the right choice for a range of small to medium size jobs. The Senco-PC 1010 can deliver as much as 20-22 drives per minute. The machine is highly efficient when it comes to time management, as it takes it only 128 seconds to pump up and a mere 35 seconds to recover, reducing the amount of time spent waiting for sufficient power. Its one-gallon capacity makes it an ideal choice for home improvement and renovation jobs. The PC 1010 is very quiet making it possible to do jobs at home without disturbing sleeping babies or sensitive neighbors. Its feet are also covered with rubber, there won’t be an incidence of the machine scratching hardwood floors and making unpleasant signs. The box items included a regulator, pressure gauges, the compressor, an air filter and 1/4-inch universal coupler. In addition, it comes with concise and clear direction booklet which makes it easy to use the first time. 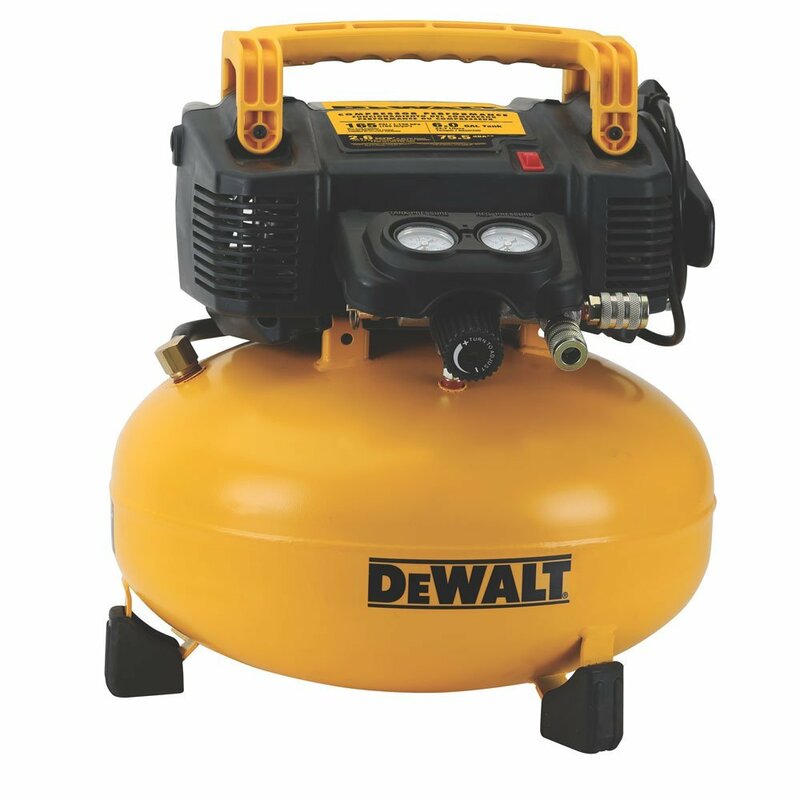 If you are looking for a highly efficient and dependable compressor that can easily be controlled by one man, then the Dewalt D55140 is your right pick. It has a compact design and works very quietly. Therefore, this is the ideal tool for finish carpenters and woodworkers. It has a wide range of uses including; installation of shelves, cabinet installation and custom installation of other furnishings. It can also be used by plumbers for pressure testing of plumbing lines. The Dewalt D55140 key features include a one-gallon tank, a 2.6 amp motor and a quiet 69db rating. The motor delivers a 0.75 SCFM at 90PSI and 135 PSI max. This accounts for its high performance and prompt recovery. It possesses a high flow regulator that guarantees maximum air pressure to improve performance. It features an oil-free pump, which allows for maintenance-free operation and allows for a neater working. The machine is highly durable as it possesses a frame that protects it from routine wear and tear and any accidental damage. Weighing in at 22 pounds, the Bostitch CAP1512-OF is ideal for powering pneumatic tools that require compressed air. They are many things that you can use this machine for, from blowing the dust off tools to inflating tires. Its modest weight and nice looking handle makes it easy to transfer it from one location to another. 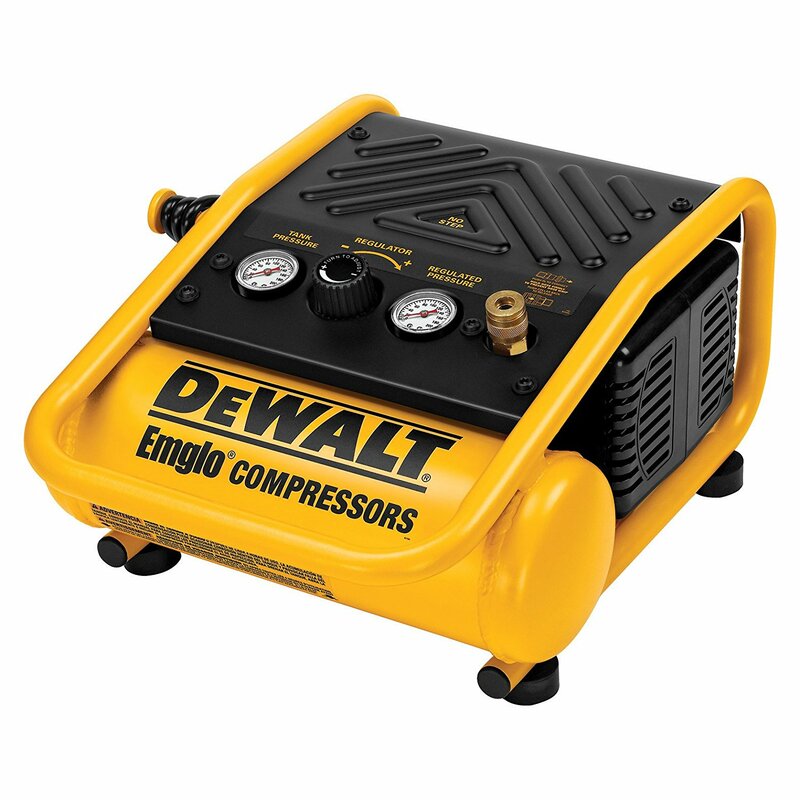 This compressor has a high output pump that delivers 2.8 CFM at 90 PSI and 150 PSI max operation. In fact, you can use it for multiple finish tool operations. It motor runs at 2.0Hp at its peak and 1.5Hp during operation utilizing 12amps for easy startup. The cord is thick and attaches firmly to the body of the compressor so it’s hard to pull loose. It is an oil-free compressor, allowing for low maintenance and usage in a clean room environment. The compressor comes with a safety valve which prevents the air valve from being over-pressurized. The Bostitch comes with 1.2-gallon tank and weighs 23.5 pounds, which is lighter than others on this list. 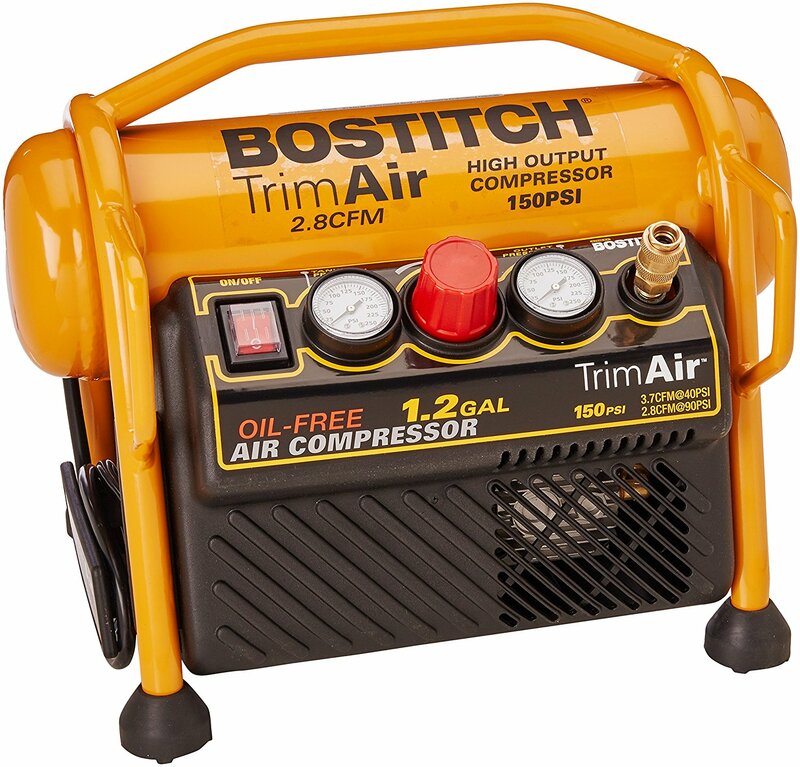 It features a large top handle, two smaller front hands, and legs that protect the tank, controls and gauges and it is suitable for pros who need an air compressor that can handle some heavy usage. It is extremely difficult to find a compressor with a six-gallon tank that won’t take a toll on your budget. But there is where the DEWALT DWFP55126 comes into the picture. The larger storage capacity is a big plus as it takes away the common storage problem associated with other compressors. Despite its capacity, it gives off a sound of 75db, which is very manageable, particularly when you stay at least three feet from the machine. In fact, the DEWALT DWFP55126 offers a 165 max PSI and 2.6 SCFM which delivers at 90 PSI pump. It is an oil-free compression machine, which means it requires no maintenance. This compressor is highly durable and ensures you enjoy it for a good number of periods before needing replacement. The machine has a regulator adjustor, power on and on switches and pressure gauges. 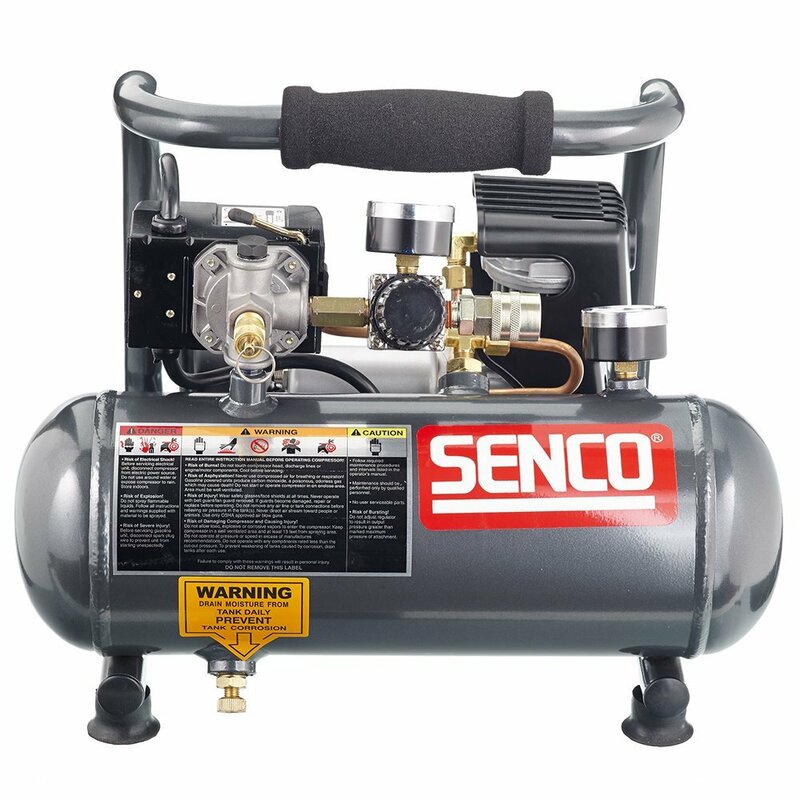 Choosing the best air compressor for paint sprayer can consume your time through researching, consultation, and comparison especially when you are looking at dropping a lot of cash. With a few more findings such as reading more reviews on the actual product page before buying, you can make an informed decision because you will be more knowledgeable than the average searcher on how to select the best air compressor for paint sprayer.